The idea of a "two tier fleet" is often proposed as a solution to the Royal Navy's current shortage of surface escorts. Building a larger number of light frigates instead of some of the "tier 1" force of high end surface combatants. In the view of the author this approach is dangerously flawed. Not only are these types of ships profoundly unsuited to the RN's needs, but their introduction would put Britain's already stretched military credibility at risk; as well as the lives of a large number of sailors. It is very easy to forget that the RN has been down this road before; and has seen the dead end that it leads to. The Falklands War cruelly exposed the severe deficiencies of low end surface combatants. A large part of the problem is that on the surface these ships appear little different from their more expensive high end counterparts. To a politician one grey hull with a gun on the front looks little different from another. However, their outward appearance of power hides the lack of real capability. Type 21, the RN's last light frigate, looked like a modern warship; bristling with guns and missiles. The only problem was that its Sea Cat missiles, intended for self defence against aircraft, were obsolete as soon as the ships were launched. Without the complex radars and computer systems necessary to manage a modern anti aircraft missile system, like Sea Wolf fitted to the Type 22s, Type 21 was essentially defenceless in the face of old aircraft dropping unguided bombs. Their missiles were so useless that the Type 21s entered "bomb alley" with crew lining the upper decks to fire small arms and 20mm Oerlikon cannons at their attackers. That's why of the seven Type 21 frigates that sailed to the South Atlantic in 1982 only three returned undamaged, and two did not return at all. If the Argentine ground crews has fuzed their bombs correctly, more would almost certainly be sat at the bottom of San Carlos Water. Even the large capable "high end" warships often struggled to defend themselves in 1982, but at least their modern armament gave them a fighting chance. As for the surviving Type 21s, they spent the rest of their careers patrolling the benign waters of the West Indies. The navy learned a hard lesson about light frigates in 1982. 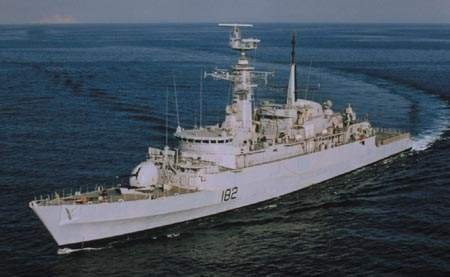 In response the Type 23, originally intended as a minimum towed array ship, was extensively redesigned and became a high end general purpose frigate. This is why the government's recent talk of a "lighter general purpose frigate" to follow on after the 8 high end Type 26s arouses concerns in the mind of the author. There is a lot of room for maneuver here, it's perfectly possible to produce a credible warship smaller than the 7,000 tonne Type 26 (which, as I laid out here, is more akin to a cruiser anyway) but a design in which self defence capability is compromised in order to achieve a low unit cost would be a dangerous waste of money. If a light patrol ship is required for constabulary tasks and presence then a large OPV will suffice, it'll be cheaper and clearly not intended for combat. If, on the other hand, you're interested in warfighting then anything that can't defend itself against a range of likely threats is worse than useless and liable to get a lot of good people killed.